Traveling to Destin during the off-season is very relaxing. Traffic is lighter, smaller crowds, moderate temperatures and tons of activities. 1. 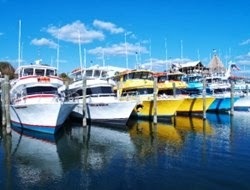 Dolphin Cruise- This 2.5-hour cruise through Destin Harbor and Gulf of Mexico enlightens tourists on the history of Destin while keeping a watchful eye out for dolphins. The glass bottom boat allows tourists to view dolphins above and below the surface of the water. 2. Fishing- Tourists flock to The World’s Luckiest Fishing Village year round in hopes of catching the big one. Florida’s largest charter fishing fleet calls Destin home and skilled captains guiding seaworthy vessels are ready to share their favorite fishing spots. 3. Dinner Cruises- Tourists seeking a bit of luxury can cruise the calm waters of the Choctawhatchee Bay on a fine dining and dinner cruise. Guests will enjoy a three-course dinner and live entertainment during the three-hour cruise, and alcoholic beverages are available for additional purchase. 4. Helicopter Tours- Passengers will enjoy a bird’s eye view of Destin’s white sand beaches and emerald water. Tours range from 5 to 40 miles and marine wildlife sightings are common. 5. Parasailing- Up to three people can fly at once while exceeding heights of 500 feet. After their flight, tourists will enjoy a cruise of the Destin shoreline.